I am thankful for my family that loves me. Some of human membears, may not want to admit it, but it's true. I am thankful for times when my brothers can come for visits, this week it's Buster's turn till Thanksgiving. 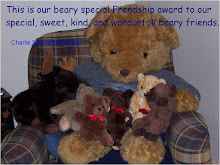 I am thankful for all my friends and the blogging bears I have met since starting my blog. I hope and pray that all of you have a Happy Thanksgiving! Don't eat too much turkey, especially if you are a bear, remembear, you are already stuffed. I forgot to ask a beary important question. What are you thankful for this year? And a Happy Thanks-Giving to you Buttons, your hug & family. 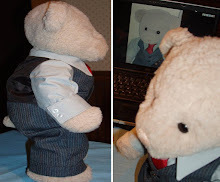 And, if you are free on the 30th, please do join me for my very ever first Bear-day - your invitation is on my blog! I love Honey also. I think if there was a bearpede here, then Taddy and I would step on smaller paws. As a result, we have learned to pick up smaller bears when we run. We are quite a bit bigger, so we want to as helpful as possible. I am also thankful that I now live close to you and your Mom and Dad. It is extra-special when I get to see you and in-between visits there are no longer years. I am thankful for my country and all those who have given their lives for our freedom.